A while ago I bought some wild rice and hadn’t got round to using it. I decided it was about time to do something. The last two Sundays I’d bought lots of kyomi oranges from stallholder Jillian of Fruition. It seemed a good idea to buy some duck breasts to go with these ingredients. So, the result is a bit of a different take on duck à l’orange. I think it’ll now be a favourite for special occasions particularly during the summer. Prepare the duck breasts – on the skin of each duck breast make diagonal cuts one way and then the other way, approx. 2cms apart. Rub a little coarse sea-salt on the flesh side of each breast. Put the duck breasts into a dish flesh side down and pour over a little whisky (the whisky isn’t essential but adds to the flavour). Tuck some of the thyme under and around the breasts. Rub sea-salt on the skin of the breasts. Set these aside to marinate. Put the rice in a bowl of cold water and leave to soak for about an hour. Drain and tip it into a pot of boiling water. Boil for 5 minutes and then drain. While the rice is soaking, in a pot melt the butter and add the onion and carrot. Soften for about 10 minutes, add the rice once it’s boiled, stir and cook for a few more minutes. Preheat your oven to 180°C. Transfer the rice mixture into a baking dish and pour over the chicken stock, add thyme and bay leaves. Cover the dish with foil tightly and place in the oven and cook for about 45 minutes or until the rice is tender. When cooked drain off the stock that hasn’t been absorbed. While the rice is cooking make the dressing. Put the orange juice in a pot and simmer until it’s reduced to about ½ cup. Mix in up to ½ cup olive oil, 2-3 tsps of pomegranate dressing, garlic and salt and pepper. Once the rice is cooked and drained add stir in half the dressing. Taste. At this stage you may like to add more pomegranate dressing. It’ll depend on the sweetness, or otherwise, of the oranges. My oranges were very sweet and I wanted a little more sharpness so added more pomegranate dressing. To cook the duck breasts, heat a heavy pan and pat the breasts dry with paper towels. Place them in the pan skin side down. Turn the heat to low. Leave for about 8 minutes. The fat will come out of the skin which will end up brown and crisp. Take the pan off the heat and pour off the fat. Turn the breasts over, return the pan to the stove and turn the heat up. For pink cook for another 8 minutes (depends on the thickness of the duck). Remove, cover and set aside to rest for 5 minutes. While the duck is resting assemble the wild rice salad. Add the nuts, spring onions, parsley, zest, raisins and any vegetables you have done. Slice each duck breast. Return any juices to the pan. Put the wild rice salad on individual plates or one large platter. 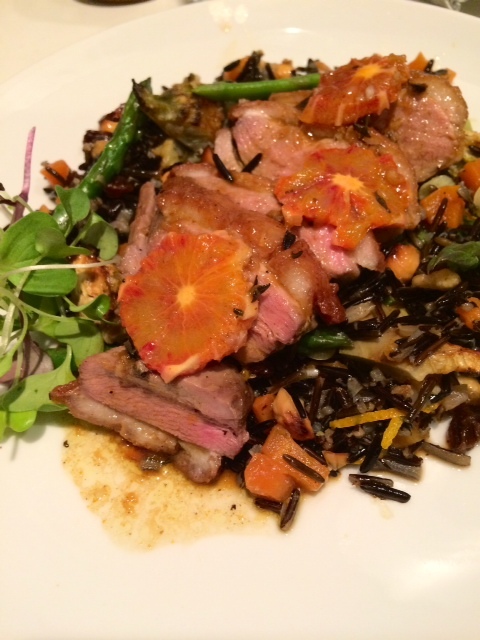 Top with the sliced duck and a few segments of orange. Put the pan back on the heat and pour in the rest of the dressing. Let it sizzle for a moment and pour over the duck breasts and salad.